Fine particles are of most concern because of the fact they are small to get through your sinus cavities & into your respiratory system. Therefore, it is very important when thinking about which air cleaner to buy to make sure it will be able to filter all of these particulates. The size range will vary from 9 micrometers to 0.02 of microns in size.This is why the TPA technology has become so important to the air cleaning industry. Particulates in this lung damaging size range are some bacteria, most molds, fumes, smoke, smog, diesel exhaust, cat allergens, pollen fragments, house dust mite allergens, settling dust, and suspended atmospheric dust. 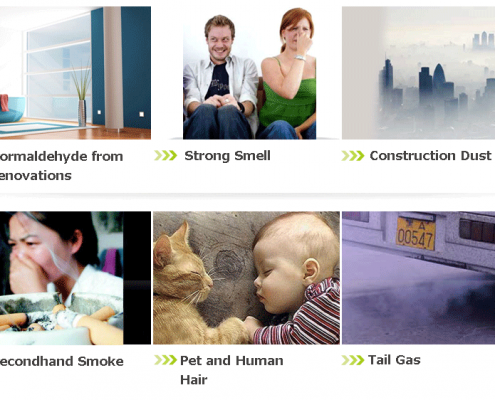 All of these particulates can cause an allergic reaction. Keep in mind, it is still necessary to filter out particulates smaller than these, but particulates smaller than 0.3 microns ers has a better chance of being exhaled out of your respiratory system. However, some of them will still remain in your lungs to do damage. Therefore, an air cleaner’s ability to remove particulates in the 0.02 to 0.3 microns is important, since this would include some pet dander, some house dust mite allergens, and some of your smokes and smog. In the same time it should be able to kill (not filter out) bacteria, germs and viruses. POIEMA TPA Clean Air System is able to trap particles as small as 0.02 microns . It uses the patented electrodes to generate the unique electrical field, which traps pollutants and common allergens to continuously create fresh and clean air. It also utilizes ionic wind technology to generate a natural air flow without a motor. The powerful electrical field will kill any airborne bacteria, germs and viruses instantly. It is a brand new experience to continuously create clean and fresh air 24/7.